Limit 1 per person, may buy 1 additional as gift. Voucher must be redeemed online using link provided with voucher. Contact Sam's Club at LIVE CHAT with questions. Purchaser must provide a valid ID at Sam's Club Membership desk to get physical membership card. Voucher is non-transferable. Not valid for membership renewals. Valid for new Sam's Club members only; not valid for those with a current membership or those who were Sam's Club members less than 6 months prior to 2/1/2019. Please allow 5-7 days for delivery of the $10 or $20 eGift Card after activating your new membership. 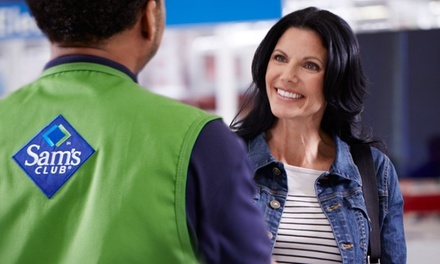 Your $15 eGift Card will be delivered approximately three weeks after your first purchase of $15 or more on SamsClub.com. Both eGift Cards will be delivered to the same email address used to activate your membership. Free offers will be delivered as Instant Savings. Instant Savings, including the basket off offers of $10 off of $10 of qualifying fresh produce, or $20 off of $20 of qualifying fresh produce, will be loaded onto new membership account within 72 hours of membership activation.Qualifying fresh produce is produce sold in-club at regular price; discounted produce items do not qualify toward basket total. Purchasers will be opted into Sam's Club auto renewal program upon first transaction in club. By enrolling in Sam's auto renewal program, you authorize Sam's to charge the card selected an annual recurring charge in the amount of the, then standard, membership fee for all active memberships on your account. See Full Terms.